DUDE TETSOLA IS A HOUSE HOLD NAME IN THE NIGERIAN MUSIC ENTERTAINMENT WORLD, THIS IS THE LAST SINGLE HE IS DROPPING BEFORE THE RELEASE OF HIS MUCH AWAITED ALBUM WISH TITLE IS GONNA BE REVEALED A WEEK BEFORE THE RELEASE OF HIS ALBUM. THIS SINGLE IS TITLED SHAKE E WISH MEANS, SHAKE IT. THE SONG IS PRODUCED BY THE MASTER HIT MAKER HIM SELF, PUFFY T AND THE SONG WAS MIXED AND MASTERED BY THE LEGEND HIMSELF, CHRIS OKORO. 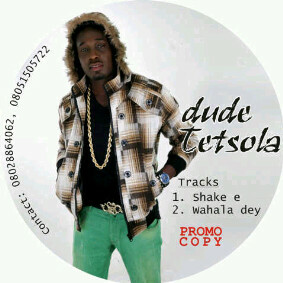 ENJOY THIS MASTER PIECE FROM THE GREAT CROONER HIMSELF "DUDE TETSOLA"